Henry IX was a quick little mobile robot with an articulating arm mounted on a tank-like turret. The pneumatic-powered gripper reliably picked up and released the ringers. The smooth and quiet 6-wheel drive was based on proven AndyMark gearboxes. 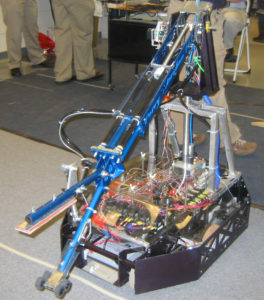 The chassis was modeled after Swamp Thing’s 2005 chassis; the small octagonal frame made it easier to get into tight spots and more difficult for opponents to pin us. FAST – The drive was fast, the arm was fast, the gripper was fast. The robot’s braking system prevented the robot from being pushed around while trying to score. This was the first time we have had a robot that was fully ready to compete BEFORE we crated and shipped it. During the demo at the Open-House, Henry IX scored in autonomous mode and then scored five more ringers and drove onto a 12-inch platform, all in 1 minute 55 seconds.